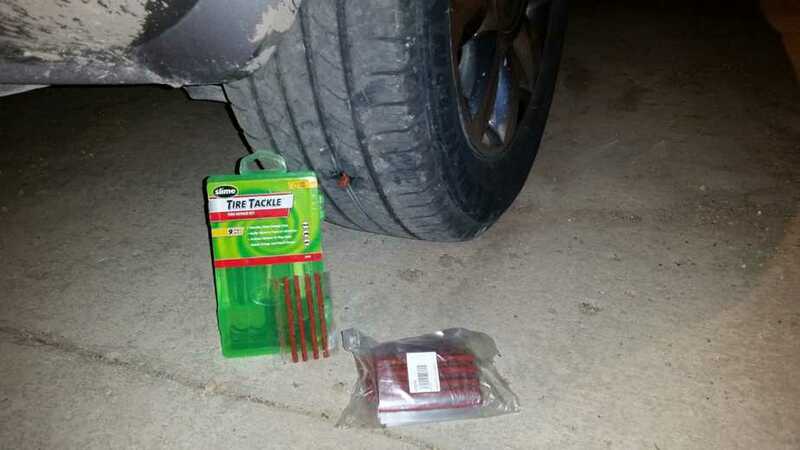 In the past week I have used my tire plug kit twice, once on my riding mower and once on my car. What would have put off mowing the lawn when I had the time or taking more than an hour to get the car fixed turned out to only take 5 minutes. What makes putting in a plug so great is you generally do not have to take the wheel off. You just pull out anything in the hole (nail, screw…) and put in the plug. This not only saves you time but generally is easier. 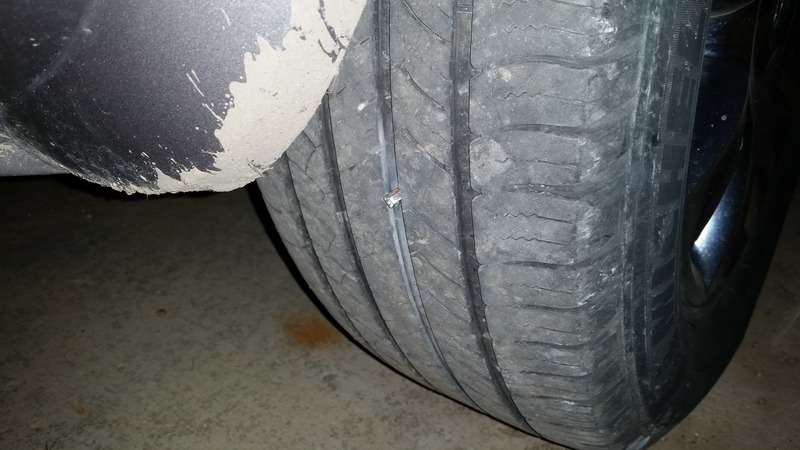 If you look in the middle of the tire you can see a driver bit stuck in the tire. I took a pair of needle nose pliers, pulled it out and first used the reamer and then stuck in a plug. Less than 5 minutes including pumping the tire back up. Since a kit is less than $10 you should consider having one in each car. If you are on the road and catch the leak soon and are quick about plugging it you might be able to make it to a place that has a compressor. But it would be good to have some kind of small compressor in your vehicle. I don’t have one because for years I’ve had GM vans that had an air port on the load leveling system that could be used to pump up tires. Keep in mind tire plug kits are only for tubeless tires. If you have a leak in a tire with an inner tube to fix it you pull the tube out and put a patch on the tube. Anyone who fixed a bike tire knows this routine. Many tractors and wheelbarrows also have inner tubes. If you have these kinds of tires you should probably have a patch kit as well.